Home > Essays > Does economics growth bring increased living standards? Does economics growth bring increased living standards? Increasing the rates of economic growth has long been the holy grail of conventional economics and politics. To a large extent, most developed economies have been highly successful in increasing economic output. But, has such an impressive increase in national output actually improved people’s standard of living? 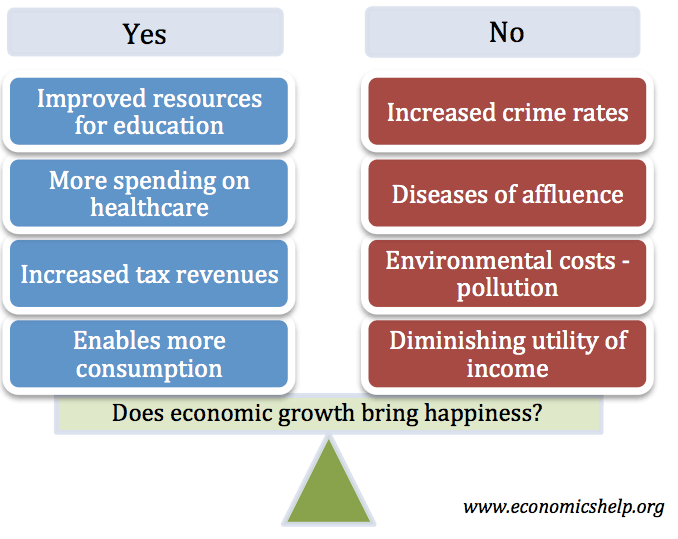 To decide whether economic growth has increased happiness is highly subjective, and it is difficult for economists to make concrete arguments. However, it is worth noting the various side effects of growth and consider there impact on general living standards. Consumers can benefit from consuming more goods and services. An assumption of economics is that consumption is related to utility, so in theory, with higher consumption levels, there is greater prosperity. With increased tax revenues the government can spend more on important public services such as health and education. Improved health care can improve quality of life through treating diseases and increasing life expectancy. Increased educational standards can give the population a greater diversity of skills and literacy. This enables greater opportunity and freedom. Education is seen as an important determinant of welfare and happiness. Economic Growth helps to reduce unemployment by creating jobs. This is significant because unemployment is a major source of social problems such as crime and alienation. However, despite rapid increases in economic growth since the Second World War, areas of high unemployment in the EU remain. For example, in France and Spain, there are currently high levels of structural unemployment. This kind of unemployment may not be reduced by economic growth. It is important to look at economic growth over a long period of time. At the turn of the Twentieth Century, in US and Europe, there was widespread poverty amongst the working classes – with poor people experiencing malnutrition. 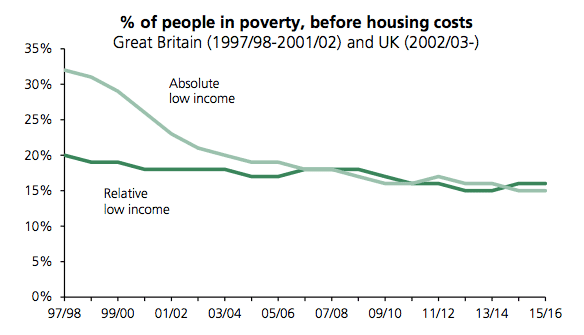 Even since 1945, absolute poverty levels have significantly fallen. S.E. Asia has also seen significant decreases in absolute poverty – due to high rates of economic growth in past few decades. Economic growth will be important for reducing absolute poverty and increasing life expectancy in Africa. If a section of the population is living in absolute poverty, economic growth enables people to have higher incomes and therefore they will be able to afford the basic necessities of life such as; food, and shelter. When economic growth can overcome this type of poverty there is a clear link with improved living standards. However, when incomes increase from say $35,000 a year to $36,000 the improvement in living standards is harder to justify. The diminishing marginal utility of income and wealth is a basic economic concept, which suggests the tenth unit of a good will give much less satisfaction than the first. If we already have 2 cars, do our living standards really improve if we now have the capacity to own 3 cars? Often as economic growth increases incomes, people increasingly save their money (higher marginal propensity to save) this is basically because they struggle to find anything meaningful to spend their money on. Economic Growth with involves increased output causes external side effects, such, as increased pollution. Global warming from pollution is becoming a real problem for society. The economic and social costs could potentially be greater than all the perceived benefits of recent economic growth. However, it is worth noting that economic growth doesn’t necessarily have to cause pollution. The benefits of growth could be used to develop better technologies that create less pollution. It is just at the moment this has been a low priority. 2. Economic growth can cause increased inequality. It is perhaps a paradox that higher economic growth can cause an increase in relative poverty. This is because those who benefit from growth are often the highly educated and those who own wealth. In the 1980s and 1990s, higher growth in the UK and US has resulted in increased inequality. (1) However, it depends on how growth is managed; economic growth can be used to reduce inequality, for example, the economic growth which occurred in the 50s and 60s helped reduce inequality. It is another paradox that as incomes increase and people are better off the level of crime has increased as well. (2) This suggests that crime is not motivated by poverty but perhaps envy. One reason why crime rates increase is that quite simply there are more things to steal. Back in the 1930s auto theft, mobile phone theft e.t.c were rare or non-existent. Economic Growth has created more goods to steal. However, the link isn’t absolute for example in recent years crime rates in the US have reduced from their peak. But there has been a general association between growth and crimes. In the beginning of the industrial revolution, higher growth led to people working lower hours. (3) However, in the past couple of decades, higher incomes have actually led to people working longer hours. It seems people are unable to enjoy their higher incomes. Feeling the necessity or preferring to work longer hours. This suggests people are valuing earning money more than leisure. However, this trend may also be due to companies wanting people to work longer hours. The United States Crime Index Rates Per 100,000 Inhabitants went from 1,887.2 in 1960 to 5,897.8 in 1991. By 1991 the crime rate was 313% the 1960 crime rate. There are clearly some benefits of economic growth. These benefits are most visible when for low-income countries. Economic growth enables the possibility to deal with many serious problems of poverty, homelessness and lack of basic amenities. However, this paper is more interested in whether economic growth in developed economies is actually increasing living standards. Does rising incomes equal rising satisfaction? The answer is not clear-cut. However, there are clearly several issues, which suggest that economic growth, has contributed to serious social, environmental and economic problems, which have reduced living standards. This is not to say economic growth is doomed to bring unhappiness. In fact, the challenge is to harness the potential of economic growth to make sure it really does increase sustainable living standards. Your answer is really amazing.It is short and to the point.By reading once one can understand the contents.Thank you😇😊.